Population: About a quarter million, mainly Spanish/Indian descent. Landscape: Rocky, low hills, hot. With murky water lapping polluted, dirty beaches. Visited: April 4-6, and then 11-17. The inside dates were while we were inland. 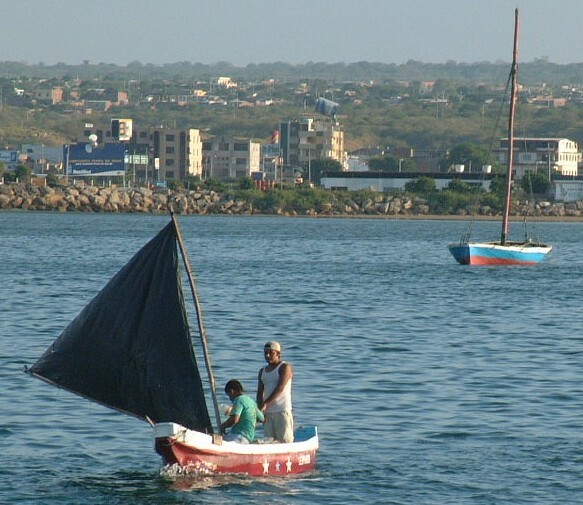 History: Manta has a seafaring history that extends back more than 1500 years (yes, to 500 AD). Early pottery records, show that the Manta people were skilled navigators, sailing as far as Panama and Peru, and perhaps to Mexico and Chile, as well. After the Spanish conquest, the town was ravaged by pirates and various marauding European invaders. Three times between 1543 and 1628 the city was laid to ruin. Many inhabitants fled inland. Today's Manta sailors continue the seafaring tradition, taking their open "pangas" many miles onto the open sea, often for days at a time. We saw some of them hundreds of miles offshore, and other yachts mentioned being chased by some who wanted nothing more than some fresh water. The nicest view of Manta: from afar. (Amanda age 13) How to describe Manta? Well, I believe stinking, dirty pit-hole would do it all right. I didn't actually spend much time in the town proper, except for a time or two when I went to email with Rachel, though I did spend many, many afternoons at the yacht club, enjoying the pool, basketball court, or tennis courts. It was a bit odd swimming in the pool, however, because I knew that Manta's water system is contaminated with mercury. It's a bit disturbing to be swimming around and enjoying yourself, only to suddenly remember that you're swimming in a pool of mercury. It didn't disturb me all that much, though, as I kept swimming there. During our time there, I also learned something very surprising and a little worrisome. Apparently, all of Manta's water supply is contaminated by mercury, and possibly other toxins. Any drinkable water in the city is bottled outside and shipped in. I'm astounded that a city the size of Manta can survive on such a system, but either they cannot afford to clean up their water or don't feel they need to. Very odd. 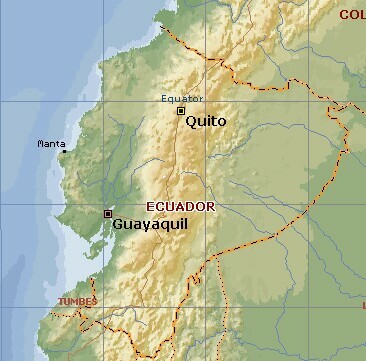 (Jon) As a general rule, I enjoyed Ecuador. The people, sights, landscape, and culture were delightful. Food, accommodation, and transportation were cheap (always a good way to gain my appreciation). But I'm not really a city guy, and Manta was not even my favorite city. We didn't have any real problems there, but it was just grubby and had little redeeming value. Every other Ecuadorian town we visited had nice parts, and we could usually find them in less than an hour -- a park, public square, church, shopping street, or even a colorful market. We never found a nice side to Manta, even after staying there for a week. There were no grassy parks or even sculptures. The parks were usually overused dirt, with heavy fences enclosing broken playgrounds. The promenade along the waterfront had big holes and often smelled of sewage or fish guts. The yacht club had a nice restaurant, swimming pool, showers, and good security, but like a nice resort, it was an artificial setting. (Sue) Not much to add to all of that, except that I enjoyed the local market -- actually one long, jam-packed street with vendors along the sides with their stalls of papaya, avocados, bananas (called "guineos"), cabbage, onions and potatoes. They don't even close the street off to traffic, so it was quite a zoo. There were a couple up-scale supermarkets, though, and the food was good value, though not as inexpensive as in Panama or Venezuela. The food stalls with their meat skewers were great for a quick dinner for $1.50! 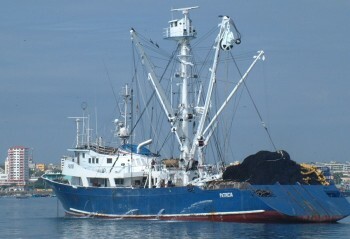 Although not as colorful and "ethnic" as inland Ecuador, Manta is a very real part of this seafaring nation. It's history is fascinating, and it houses the S. American west coast's largest tuna fleet. And probably the west coast's largest tuna stink. Ah well, can't win them all. On the up-side, it was a safe place to leave the boat to travel inland and to pick up last-minute provisions before sailing west.